Jacob Weeter, who arrived at Licking Creek with his family as a boy, stayed on to farm. His son, Frederick Weeter, was born in 1833. Ten years later in 1843, Peter Weeter, the old pioneer and family patriarch, passed away at his farm in Licking Township. Catherine (Over) Weeter, our family matriarch, passed away in 1854. She must have been a strong and remarkable woman. Our Weeter homestead that we remember was north of Licking Creek and about a mile southeast of Callensburg. We suspect that this may have been across the road from an 1800's homestead of Jacob Weeter and, then, the home of Frederick Weeter. Our grandmother, Margaret (Snow) Weeter, told of the natural gas seep off to the east that was piped to the house at the time of the Civil War. A visit to the old homestead in the 1950's was to turn the calendar back a century. Most of the old gas light fixtures would glow all day. They would be turned brighter and back down as needed. Water was carried inside by pail from a hand pumped well just south of the kitchen porch. The kitchen cook stove burned wood and coal. The furnishings of this modest Weeter home were a page out of history. The tables and chairs and beds and dressers were from the 1800's. An outhouse was around behind and the smokehouse and shop were below the water trough out front. A screened summer kitchen with a cook stove had been out front at one time, too. The huge old barn was a focal point on this working farm and stalled a work horse team into the 1950's. The 70' x 45' barn was built of massive white oak timbers. A weathered plank on the west corner of the barn was inscribed "Harrie" by a little boy with a pocket knife over one hundred years ago. 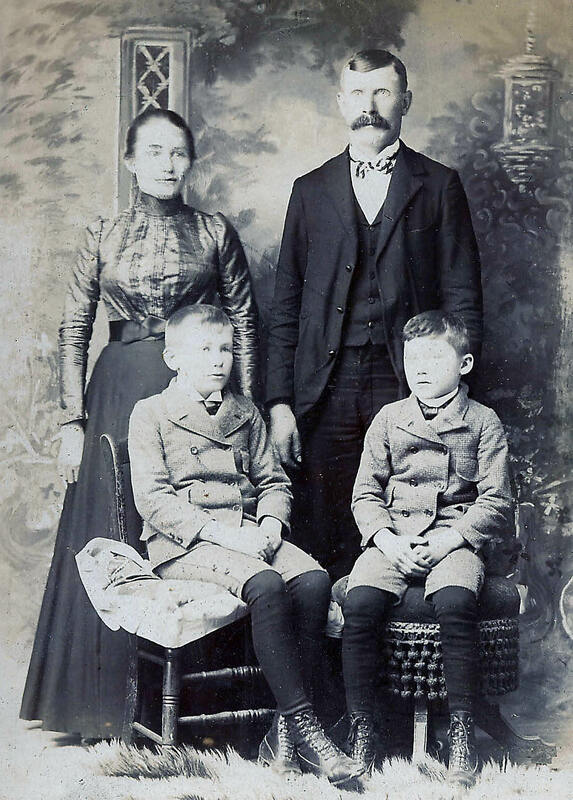 Elmer Ellsworth Weeter was born in 1870 and in 1889 married Carrie Carolyn Snyder who was born in 1869. Her father and three brothers had left home for the bloody Civil War battlefields as young men. Only Carries father would return home. Our grandmother, Marge Weeter, could recall the battles where each of the three Snyder brothers fell. Antietam and Shiloh come to mind. As a result of Elmer and Carries marriage, Earl Frederick Weeter was born in 1891 and Harry Owen Weeter, our grandfather, was born on the homestead in 1892. Elmer was nicknamed Burly and family photos suggest that he was a rugged man. Harry and Earl were raised with the work ethic and rigorous demands of life on a Pennsylvania family farm in the 1800's. School days ended for them and most of their rural classmates in the eighth grade. Both Harry and Earl were riflemen and descended from a Pennsylvania tradition of hunters and sharpshooters. We have Weeter family rifles that go back to percussion cap muzzle loaders from the 1850's. Rifles that belonged to Harry and Earl remain in our gun cabinets. Soon their lives would go very different directions. Earl was destined to remain a farmer on the family homestead until he passed away at the age of 77. He rode one of the last log rafts to market down the Allegheny River to close out an era. There are rumors of a corn whiskey still during prohibition. His smoked hams were a family delicacy and a crock of sauerkraut made by Carrie would be under the basement stairs in the 1950's. Their grandfather, Frederick, died in 1909. Elmer handled the estate and burial arrangements. We have a copy of the Certificate filled out by Elmer. 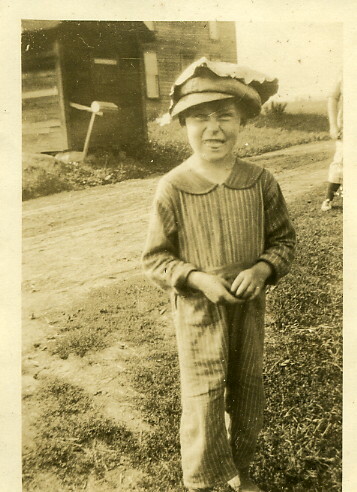 Elmer and Earl, the eldest son, now would manage the farm and Harry would strike out on his own.